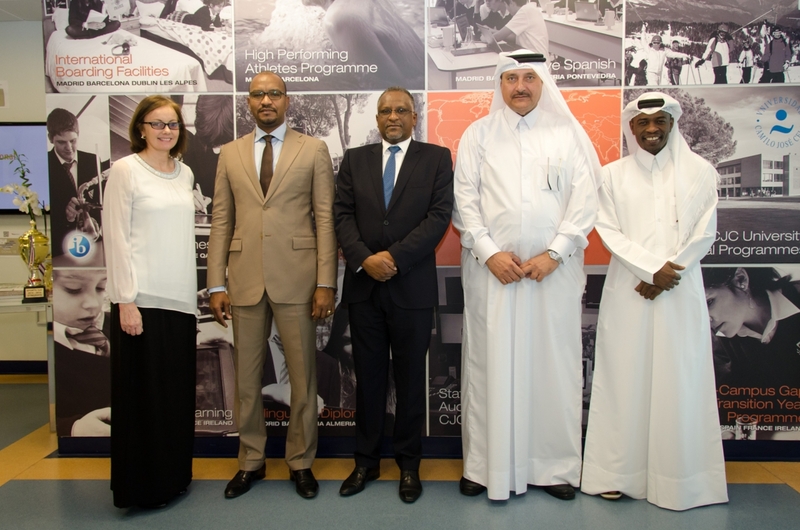 The students and staff of SEK-Qatar were honoured to receive a visit from HE Ahmat Khazali Acyl, the Minister for National Education of the Republic of Tchad accompanied by HE Aboubakar Assidick Tchoroma, the Republic of Tchad Ambassador to Qatar. In attendance also were Mr. Abdulaziz Hassan Al-Tamimi, SEC Consultant for International Education Affairs to the Minister’s Office and Mr. Jamal Al-Sowaidi from the SEC Office for Communications. The Minister and esteemed guests were able to meet with students across the campus guided by representatives from the MYP Student Council. The students were keen to describe how languages are taught in school and describe the collaboration and organisational skills needed for successful study. It was a wonderful opportunity to share perspectives on international education and the Minister was gracious with his time, meeting and chatting with students from Preschool 3 to Grade 10.